This is the time of year that I always start to suffer from spring fever. For months now, everything has appeared dormant, and there has been very little color in the landscapes. This is the time of year when I start looking forward to the lush mountain views from the Appalachian Mountains here in NC. The problem is, we are still a few months away from the true beginnings of a mountain spring. 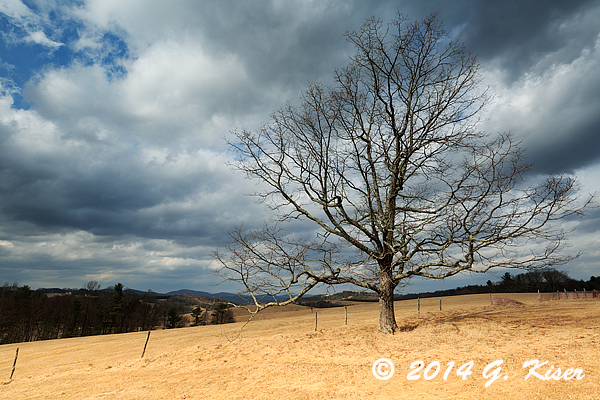 Even though there is not much in the way of color to be found right now, I have been itching to get out and do some landscape work along the Blue Ridge Parkway for a couple of weeks now. My plan was to take Toni up there and do an early morning trek and try for a sunrise as a bonus. My plans changed at 4am when my alarm rang. The forecast showed very little in the way of clouds for most of the day. This was not what I was wanting at all. Since the bed was all warm and cozy, the decision was made to roll over and go back to sleep. Those extra few hours were much needed and appreciated! After waking up, I was still looking at the weather to see if there was a chance that I would be able to get out and try for some landscapes, but it wasn't looking promising at all. There was a whitewash of clouds in the sky, and the mountain forecast seemed to mirror what I was seeing outside of my window. However, I kept my eye on things in the hopes that something would change for the better. My only regret was that Toni wasn't going to be able to join me if I went later in the day because of her work schedule...that made it much harder to decide on what to do. I finally reached that moment when a decision had to be made or I would not have any time on the Parkway. I looked at the weather which was holding steady, but there was a front that was supposed to be moving in around sunset. With Toni's help, I decided to roll the dice and head up there and try for some landscape work, followed by what I was hoping was going to be a colorful sunset. I loaded up the truck and headed out knowing that I was only going to have about two hours of light to work with before sunset. My destination was Doughton Park where I knew that I had several available options to shoot from previous experience. I started working out compositions in my head and what I was wanting to capture once I got there. As I was driving, I noticed that the sky was still mostly white, but there were a few breaks that happened from time to time, showing some faint blue. As the sun dropped in the sky, I was also able to make out some definition in the clouds. It wasn't ideal, but maybe I would have something to work with when I got up there. By the time I arrived at the parkway the clouds were nearly perfect. They were broken up, and there was a lot of density to them which gave me the drama in the sky that I was after. I was getting excited because I was needing these skies for the compositions I was working on in my head. 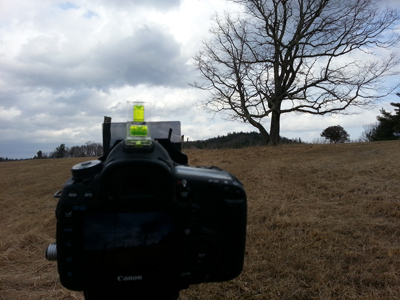 I made my way as quick as I could to Doughton Park so I wouldn't miss out on the sky. There was just one slight problem.....Doughton Park was closed for the season. It would seem that I had never come here in the winter before and hadn't given it a thought that the park would be closed. Instead of hoofing my way to the locations I had been thinking about, I decided to stay more mobile and search out something where I could make use of the light a little bit quicker. I backtracked my route on the Parkway because I had remembered seeing a particularly interesting tree set off all alone that I thought I might be able to work with. As you can see from the cell phone picture I took the lighting was less than ideal, but the sky was really great! 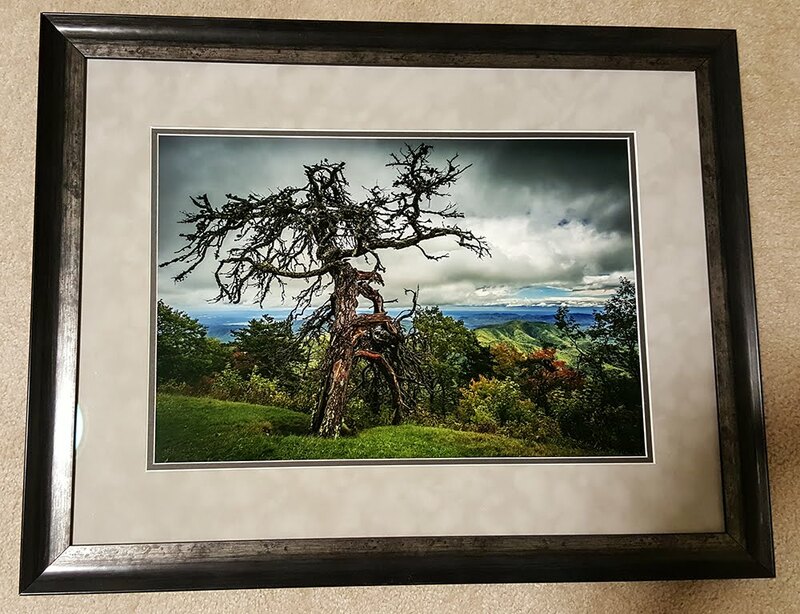 I decided to get the composition set up and wait for a break in the clouds that might let the sun shine through and give me a little bit of illumination on this tree. This is where "having an eye" comes in handy. I wasn't reacting to what I saw, but rather what I was hoping to see if the conditions changed in just such a way. It didn't take long before the sun beamed through and let things up like the Fourth of July! Fortunately, I was prepared because I had already added a 2-Stop hard edge ND Grad filter to control the sky, and help me add some punch to the ground. The light show lasted just about 25 seconds where I was able to get a handful of exposures made. You can immediately tell what benefits are gained from having the right lighting first and foremost, and then having the right equipment to take advantage of the scene. Without the filter on the lens, the sky would have lost a lot of the drama, or the ground would have still be a little dull. The filter enabled me to make an exposure that captured a complete tonal range of both the sky and the ground which makes this a very successful image. I was far from done though. There was more to this scene than just the tree. As you can see, there is the remnants of a fence that runs right along where the trunk of the tree is. 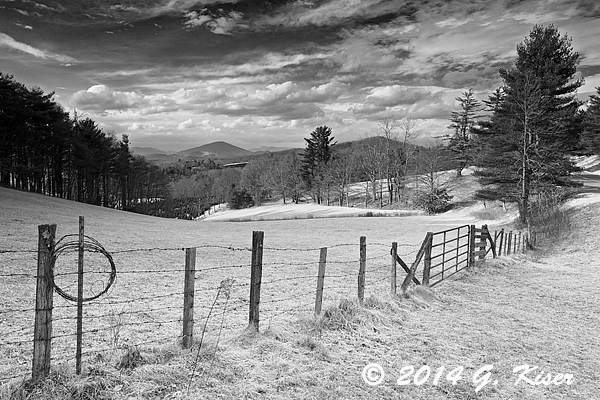 This fence, or lack thereof captured my attention and I decided to try and work out a composition that utilized those fence posts. It took a little doing to get just the right perspective, and then I had to choose the right focal length of my 16-35mm lens which would showcase the single posts to the best ability. Once again, I was very fortunate with the sky. The sun was still mostly hidden on the other side of some very dense clouds, but there were breaks in the clouds from time to time, and even better, there was a very dark section moving in from the left. This was going to work out very nicely if I was lucky enough to get the sun to peak through once again. That luck did show up, and I was able to get the shot that I was hoping for with the landscape lit up. While I'm not a big fan of what grass does when its dormant, the golden hues of the ground actually play together with the blues in the sky quite nicely. While neon grass is not an ideal element in a photograph, it is what we have to deal with in late winter before the green hues come back. Because of this odd color combination, I decided to try this composition out as a monochrome image. I've found that the better the sky is, the better a black and white image will look. I could have stayed here all day and waited to see what the sky did, but I decided that I still had a lot of good light left, and time to find another landscape ready to be captured by my camera. I loaded everything up and started back on my Southerly journey along America's Favorite Drive. I was keeping my eyes peeled for that perfect scene to anchor the sky that was fascinating me at every glance. In some sections it was nearly clear, in others it looked to be raining in the distance, and there was everything in between. I was in photographer heaven driving along through the mountains. Over my right shoulder, I happened to see another fence with a large gate that caught my eye. Beyond that fence was an expanse of landscape that appeared to include very little in the way of visible human development. I quickly turned the truck around and pulled off the road. I got out and checked the view out. I found a couple of possible compositions that would eliminate the visible buildings and towns in the distance. The lighting was good, but fading fast due to the low sun and a mountain ridge just to the left of me. I grabbed the camera bag and tripod and threw things together very quickly. Because of how the sky appeared, I knew I wanted to get a polarizer on the 16-35mm lens, and I knew the exposure would be tricky with the light and shadow, so I affixed my Lee filter holder as well. 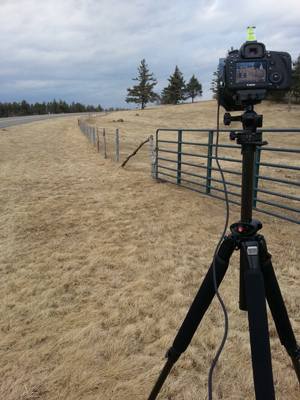 I went ahead and grabbed up several of ND Grad filters and settled on a 2-Stop, soft edge filter. I slid it in, and worked out the composition in a way that I though conveyed the scene as I saw it passing by in the truck. I was able to crank off just a few shots before the last light on the landscape faded. I am very fortunate that I have regained my ability to think about exposures quickly in the field again. While this looks like a very simple image, there is a lot going on which took a lot of thinking to put together. 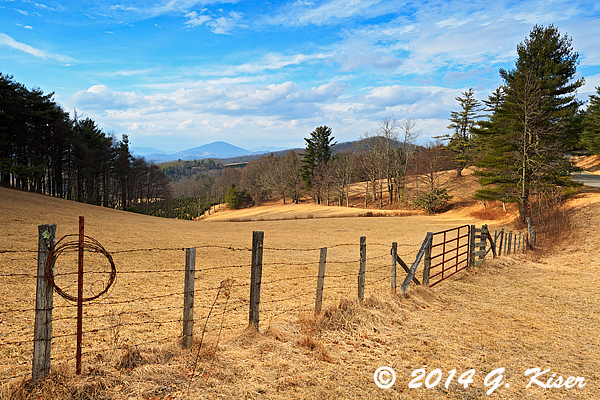 Compositionally, the fence is the leading line that is anchored by the rolled barbed wire. That line moves through the scene until it reaches the pine tree at the left edge. The visual line continues along the inner edge of the property, following the sunlight until your eyes reach the mountain in the distance. This is when your eyes bounce off of the shaded trees to the left, and fall on the sky. The clouds, while not as dramatic as in the previous images has a multitude of layers and textures. This is a truly awesome sky, which was only made possible by knowing to use a polarizer to add the visual contrast, and using the ND Grad to keep the exposure correct in relation to the ground. So much to think about, just for a simple image....and we haven't even talked about depth of field, and shutter speed concerns! While I was processing the digital negatives, I was thinking about all the work that went into making the exposure for this image, and all the different textures and lighting that was present. While I didn't have time to think about this being a monochrome image at the time of capture, I decided that it would be an excellent candidate for just that conversion. When I removed the color, and tweaked the tonal elements through colored filters, I found myself looking at a picture that really made me stop and just want to take it in. Yep, I had found my favorite from the day. There was no question about it in my mind. This one monochrome image summed up the day's experience for me. As quickly as I worked on it in the field, I wasn't quick enough to work it for very long. After just a few minutes, I realized that the light was gone, and I needed to move on. I continued South doing my normal looking left, right, front, mirrors, and repeating. I was searching for anything else that I could use with the sky which was still changing very quickly. With the fading light, I decided to give another fence with some singled out pine trees a go. The clouds were full of density, but there was getting to be less and less drama as the rain was starting to move in. This was one of those situations where I think I missed the light I was really after. 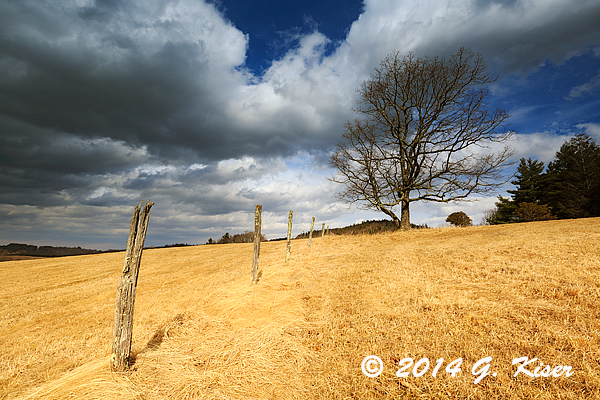 The field was awash in sunlight when I parked the truck, but by the time I got the camera set up, it was gone. The sun was now behind some very deep clouds. I wasn't quite ready to call it quits though. I had a few tricks up my sleeve that would bring some life to this shot. In order to take advantage of the last little bit of sun that was there, I used an intensifying polarizer, and to make sure that the field and fence didn't get too muddied with the clouded light, I used a 3-Stop hard edge ND Grad filter. 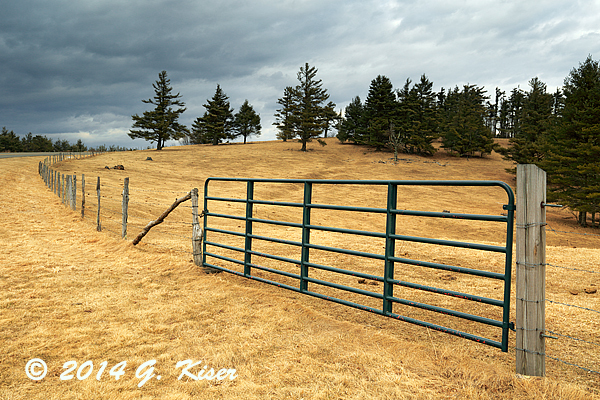 I decided on a composition that used the green gate as the visual anchor, leading to the barbed railings which took the eyes on a journey until they met the Blue Ridge Parkway in the distance which brought them back in to the pine trees at the top of the hill. The sky isn't a major feature here, but it is the element that is responsible for setting the mood of the image. What took the longest for this particular composition was waiting for the clouds to move in such a way that they added to the picture. I was very fortunate that they moved in such a way that I had deep dark clouds on the left side to keep the eyes in the frame, and then light over the trees to the right to help give them some visual impact as supporting elements to the fence. I even got lucky that the sun gave me a bit of illumination on the ground before the clouds fully engulfed my light source, and the rain started in. It was time to pack things up and make a decision on where to go next. I could have hopped on US421 and headed home directly, but I opted to try and stay in front of the rain and try for a potentially dramatic sunset. I started back North, not real sure if I was actually staying in front of the rain or not. It wasn't raining bad, but I was still seeing plenty of drops on the windshield. I finally was able to break through and found myself in a dry section. I could tell that the sunset wasn't going to do much, so I just looked for some low light twilight shots that could work. I found one that was a possibility at Bullhead Mountain. It was the typical hazy mountain shot well in the distance. I grabbed the camera and swapped in the 70-200mm lens, and even added the 2x teleconverter to get the reach that I needed. By the time I got everything set up, the moment was gone and I just got some muddy images, that didn't show a clear composition. I wasn't happy with them at all, but it was the first time that I had the chance to use the teleconverter, and I must say, I am quite happy with it. My jubilation was short lived though as the rain caught up with me very quickly. I wasn't able to break the camera down and put it back in my bag with the driving rain, so I just threw everything in the truck and decided that I would pack it back in the bag when I got home. 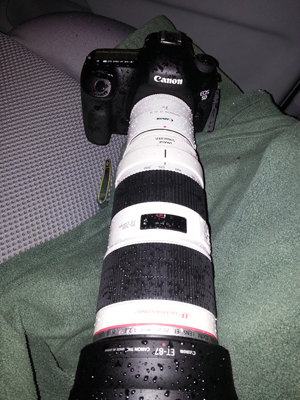 I am very thankful for the weather sealing that Canon puts into its pro line of equipment. Everything here is soaked, but I'm not worried about it one bit. I have found myself out in the rain on many an occasion, and have come to not only rely on the weather sealing for my equipment, but I also demand it. All of my lenses are L's because they all come weather sealed, and I wouldn't consider a body that wasn't sealed. The 5D MkIII has plenty of robust sealing which ensures proper operation regardless of rain or snow. Now, if I could just get a photographer to stand behind the camera that was as resilient in the face of foul weather! Last week, I set out on an attempt to photograph a barn, but the sky just didn't cooperate with me at all for what I was intending on capturing. I ended up doing some scouting in the area to try and find some other places that I could file away for future treks. One such location was an old barn beside of a school, tucked into a wooded field. Had it not been for construction on Union Cross Rd, I would have never seen it. I took some time to look at it, but determined that the lighting was all wrong. In the few minutes that I was thinking about possible compositions, I thought that a nice cloudy sky would work well for this one. I didn't put a lot of time in looking at things because I was running out of light and needed to find something to shoot for the day. Fast forward about a week and my first day off of work it was very overcast and the lighting was very even on the ground. I went through my mental list of possible subjects and quickly came up on the barn off of Union Cross. The way I was picturing it, I would be able to crop the sky out and grab the barn against the trees. That was my intended shot when I set out shortly after sunrise. When I arrived, I was a little disappointed by what I saw. Not only were the trees not as full or as tall as I had remembered, there was a lot more open area that I was having to deal with. To make matters worse, there was just a hint of green in the trees which was fine, but there were several blue tarps covering items that were stored in and beside the barn. The biggest problem was those tarps. I was having a very hard time finding a composition that minimized those tarps while keeping the sky at bay. While fully overcast, the clouds were bright, and had just a hint of texture. I had to use a 3-Stop ND Grad filter to hold back the exposure. The best composition that I was able to come up with was actually the most simple one. I used a small tree for some foreground balance, and placed a cluster of the dark green trees behind that, while keeping the barn itself in a prominent position in the right third of the frame. I was happy with the exposure, and the composition, but wasn't very happy with the scene at all. I wanted something more...I wanted color (other than the bright blue tarps which really distracted from the whole scene. 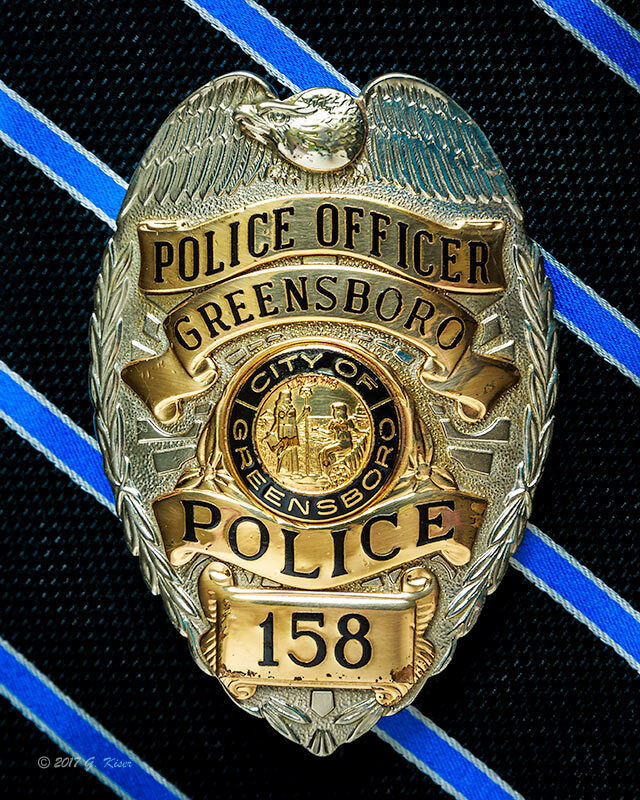 Even though I wasn't very happy with the scene as it was unfolding, I figured that I would hold judgement until I saw it on the computer at home. I thought it might look good as a monochrome image since there was not much in the way of color that contributed to the image. I knew that the exposure was solid and that everything was properly represented in tonality, so B&W would be a fine option if everything fell in place with the picture. After a half a dozen frames I decided to pack it in and move on to something else. I was still feeling like I probably wasn't going to have much to show for the morning and I wanted more. Unfortunately, I was looking for color, and this time of year has very little of that. I drove into Davidson County, and then found myself crisscrossing the county lines for about an hour as I drove aimlessly about scouting new locations. Ironically, while I was getting close to where I started I was driving down Curry Rd and found an old Ford truck (late 70's, but still a decent subject) sitting in front of a house. I was looking at it and debating on whether or not to try for a picture. 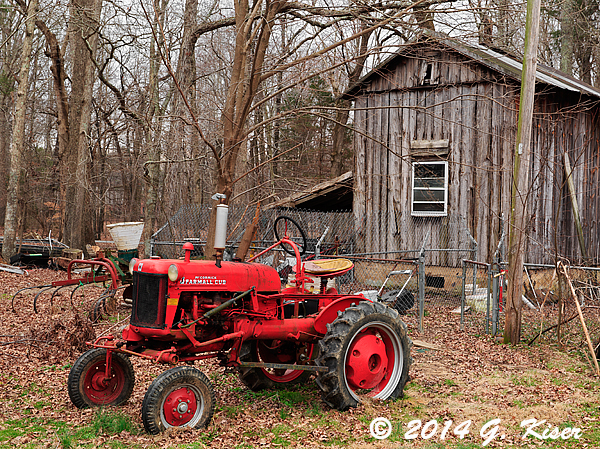 As I passed the house, I saw several old barns behind the house with some really nice rusted tractors around them. Yeah, I needed to get turned around and knock on the door for this one! I knocked, and knocked, but nobody came to the door. As I was walking back to the truck, a lady pulled into the neighboring driveway and we spoke briefly. After assuring her I was not there to commit various crimes, she told me that the property owners lived in the house much further down the driveway. I went down to that house and tried again to knock. There was no answer there either. While the tractors and barns really caught my eye, there was just no way I would feel comfortable photographing them without permission. I had to leave there with only the memory of the property for a possible later trek. Feeling completely defeated, I started to direct my route back to the house. I turned onto the main road and out of the corner of my eye I thought I saw an old red tractor. As I passed the house, I looked behind it again, and saw a barn right behind the tractor. Could it be...the color I was looking for? I had to get turned around, and I pulled into the driveway. Once again, I was going to need permission to get the pictures that I was wanting. This time, the homeowner answered the door and let me give my normal speech about my strange requests to photograph old things. He was a little hesitant, and admitted that he had never had a request like this before. It took a little bit of talking, but he finally said "go ahead and get your gear". He didn't need to tell me twice! 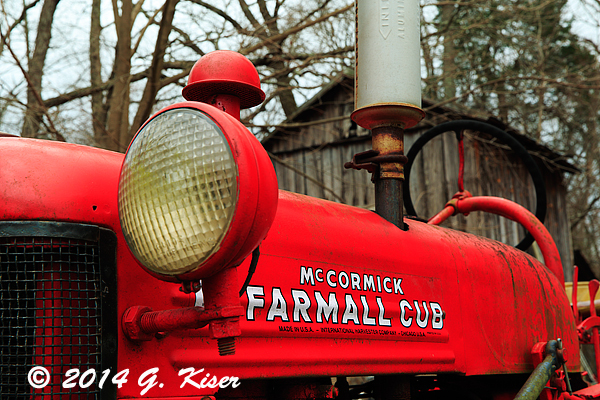 When I got around back I saw that once again, I had found an old International Farmall tractor. Seems that I am drawn to these more than any other tractor. Just as I had seen from the road, there was a nice old barn situated behind the tractor which gave the composition a very nice balance. What I hadn't seen from the road was all the visual clutter around the tractor. This meant that I was going to have to be very careful with my compositions in order to avoid getting too much visual distraction in the image. I needed to simplify things as much as I could. One of the best ways I've found to simplify a scene is to pull out intimate details. Since I seem to be drawn to these old Farmall tractors, I decided to get the label off of the hood, using the headlight as a visual anchor. 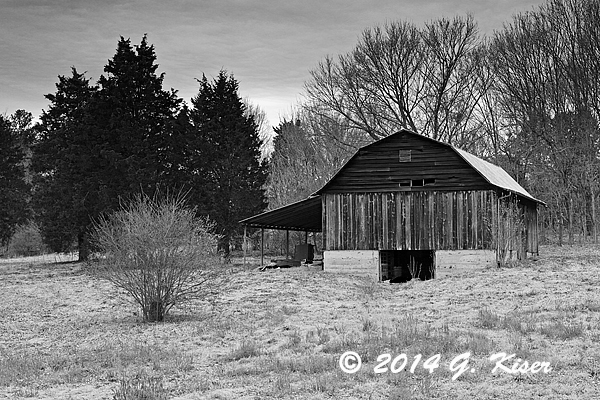 Even with this composition, the old barn snuck in and provided its textures to the background. I guess these labels are the equivalent of a hood ornament on a classic sedan. Either way, they are starting to capture my attention more and more. While it was the red that drew me to the scene in the first place, I found that the tractor was almost too much. This is very easy to find when dealing with red since it is such a powerful color. There was no way to make the tractor a smaller part of a larger composition. I just didn't have the room to deal with behind his house, and there was so much visual clutter to deal with also. I again, thought about doing a monochrome conversion on the images I was shooting. I knew that it was going to be a hard thing to separate the tractor from the background though because of the similar tones represented, but I kept the idea in my head. Ironically, the first composition that I set up was one that I didn't like at all in color. There was just too much red, but the surrounding clutter was reduced quite a bit which I did like. It was just too blatant, and in your face with the solid red, and then the sky was also a washed out gray which really messed with the flow of the image. However, I decided to do a B&W conversion on it and see what I could do. After doing some tweaks to the tonalities of the various colors, I was able to get a little visual separation in the tones. I massaged the contrast a bit, and decided that this image worked out very well. However, just in case I was stretching a little bit, I asked Toni's opinion on it. She came over and didn't even think about it long and said "I like it!" Typically, she doesn't like my tractor shots, or any of my old cars as much as my landscapes. So, I asked her if she thought it was ok for that type of picture, or if she actually liked it based on its own merits. To my surprise, she actually liked the picture, really liked it! I was sold, it would be in the gallery. 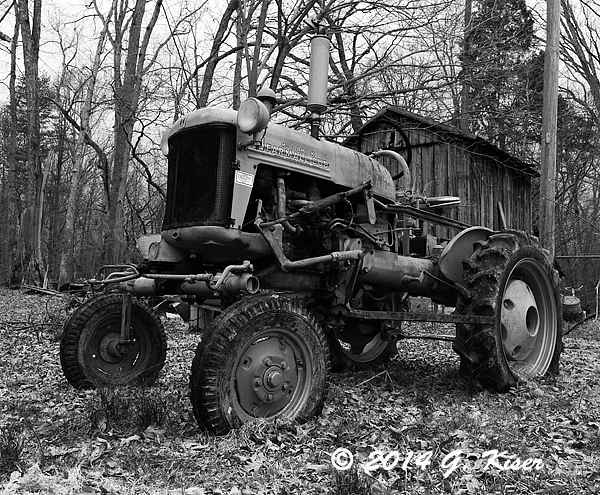 While I didn't get the images that I was previsualizing when I left this morning, I had the opportunity to get what I think is a really good B&W barn shot, along with several shots of another Farmall tractor. Photographically, it was a very good morning, and rather productive considering that I am really starting to hunger for the bright colors of spring. My want for color is limiting what I am drawn to in the current season, but I am quite used to this, and know that it happens every year about this time. I am really hoping for some good skies in the next couple of days so I can start working on my landscapes to get geared up for the Spring. I'm itching to start poking around the Blue Ridge Parkway, as that is probably my favorite place on earth to find landscapes. It won't be much longer now.